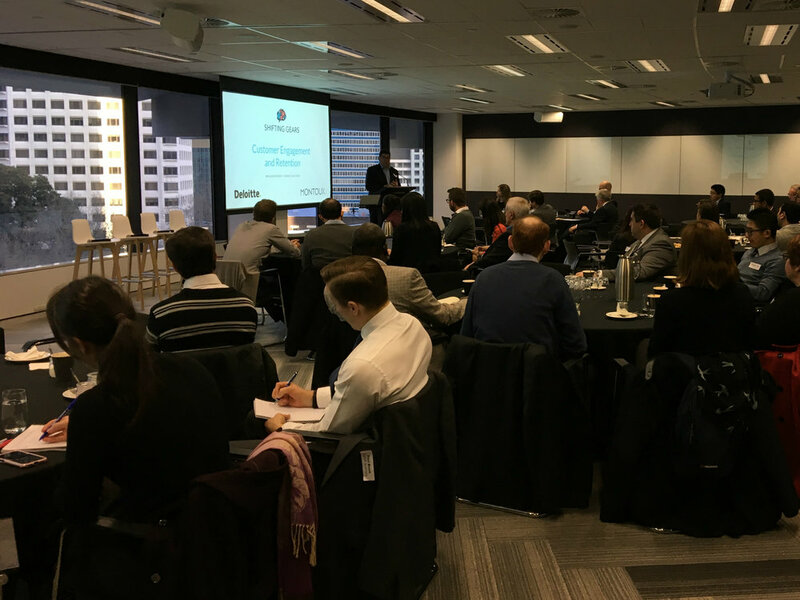 On Tuesday 10 July, Montoux and Deloitte teamed up again to bring another Shifting Gears breakfast seminar to Sydney. Guided by audience suggestions from our previous event, we decided to explore the theme of customer engagement and retention a little further - and from an alternative perspective. With limited examples of customer innovation within the life insurance industry that could be openly shared in such a forum, we decided to expand our audience’s view a little by this time inviting speakers from other industries. Deloitte Digital Director Forde Smith presented a responsive poll which was a hit with attendees, who could vote in real time from their phones. Forde posed that proposition design is currently one of the most important things for life insurers, and explained this means understanding the needs of customers and how to meet them - a competency which takes some time to develop. He believes the catalysts for this customer engagement shift lie in tech advancements, but also in regulation. Forde believes companies shouldn’t be following the trends, but rather anticipating where they’re going to be next. He says many insurance companies are heavily investing in chatbots and artificial intelligence right now, which is where the customers are - but if looking to be innovative then considering the recent demonstration of Google Assistant calling to make a hairdresser appointment, insurers should be focusing more of their resources on making a plan for ‘voice’. Deloitte Director Mark McCormick presented some of his learnings from a project Deloitte worked on in the workers compensation market, where they used data to become more efficient and improve the customer experience and outcomes when dealing with claims handlers. Mark said around five years of claims data was analyzed for a representative view of the Australian market, and ultimately used both third party data and internal data in order to automatically prioritise the most complex claims. Mark says in delivering this model to the market, by refining the data they ended up with a matrix that could be deployed to clients so they could 'score' incoming calls to claim handlers in real time. Montoux’s own Product Lead Charles Hett was joined by U Bank Lead of Digital Business Jeremy Hubbard, for a ‘fireside chat’ about U Bank’s use of artificial intelligence as a key way of achieving change in the banking industry. Jeremy said U Bank has set themselves the challenge of being a growth business who will not increase their headcount beyond the current 200 people, and achieving this will also be with artificial intelligence solutions. Jeremy also spoke about U Bank’s use of RoboChat, Australia’s first virtual assistant to help potential home buyers and refinancers complete their online home loan applications. 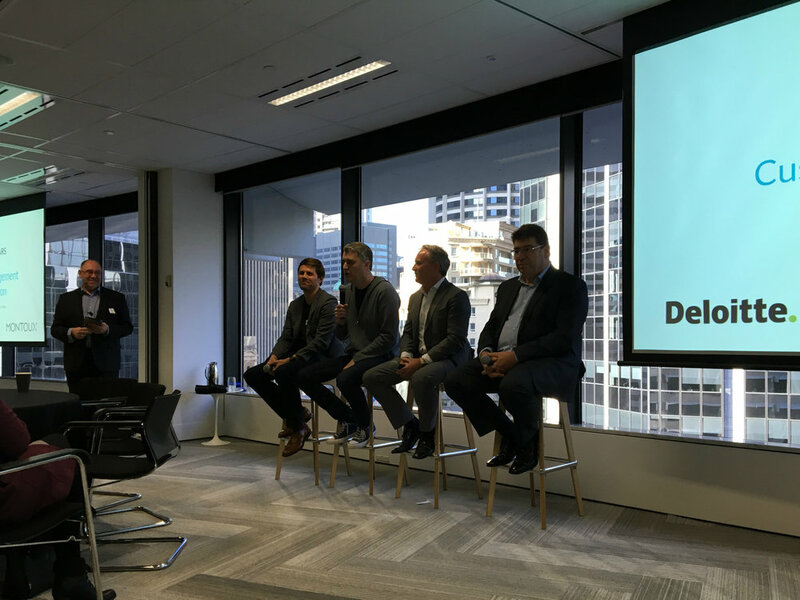 The final segment of the seminar was a panel discussion facilitated by Deloitte Financial Services Partner Al Merten - which is proving to be a very popular forum for our regular Shifting Gears event attendees. Al began by asking the panel about the challenges of engaging customers in a low touch environment, and Jeremy said U Bank decided to make themselves part of their customers' daily habits, by providing value over and above their core offering. Customer expectations are only rising with competing services like Apple and Google Pay, so it makes sense to look for engagement and retention role models outside your own industry. Smartline Director Joe Sirianni said that in his experience identifying the right mortgage provider for a customer can be made easier if the provider has created a product with the customer in mind, and being accommodating to a customer’s needs is the way to keep them. Joe pointed out the similarity between banks and insurers, who both have large legacy systems that are slow and difficult to adapt. Mark believes the challenge for insurers looking to work with startup and early maturity companies is they may not have the data quality nor sufficient data for valuable insight. But Mark suggested focusing on creating synthetic view of the Australian market, by gathering data on asset value, disposable income, and other behavioural data/indicators - all of which is accessible through different channels, including social media. Businesses can then overlay this synthetic view with their own customer data as it accumulates, which ultimately enables the business to become very targeted in their engagement campaigns and retention strategies. When sharing final thoughts, Jeremy pointed out that with all this data available the real trick to success is to make it all very simple for the end customer, no matter how complex it is behind the scenes. The panelists agreed that ultimately we want customers to come back to us and talk, if they are considering switching to another provider. We received some more fantastic feedback and suggestions from our audience, and look forward to hosting a third Shifting Gears seminar a bit later this year. If you would like to be notified about the next Shifting Gears event in Sydney and also receive a fortnightly update on industry news, please sign up for our newsletter.